Maryland Pink and Green: Lilly Spring shopping! This weekend, I did a little bit of spring shopping at Persnickety Palm. When I walked in the store, Linda, the owner of Persnickety Palm, greeted me by saying, “Hello, Bethany!” A lovely woman turned around and said, “Oh, you’re Bethany from the blog! I love your blog.” I was thrilled to meet one of my fabulous readers in person and so happy to hear feedback about Maryland Pink and Green. It was really so exciting for me. I would love to meet more of my wonderful readers and share my love of all things pink, green, and preppy. Clare dress. So comfortable and easy to wear. This is a winner to wear on the plane to Mexico on my upcoming trip. It won't wrinkle and looks crisp and cool all day long, even with a 2 hour layover. Del Mar dress in Ten Ton. This dress reminds me of something I'd wear to a 1960's beach cocktail party. It's fun and reminds me of a happy summer day. A heads up, though. . . I had to size up in this one. My minnies were so thrilled with their new panda shift that we picked up this weekend that they had to wear it to school today! Here's a fast (grainy!) picture I snapped with my blackberry before school this morning. They were so excited to wear this dress. Hope that everyone is off to a fantastic start to the day. Exciting things are in the works for this week! Stay tuned for more information. Your minnies are so adorable! Love their pandamonium!! Love the Clare dress. That is something I would wear in a day out and about running errands. Where in Mexico are you heading to? We booked Riviera Maya for July this weekend and I can't wait! Hi Bethany - It's Kathleen ( who was at the store) - It was lovely meeting you and your beautiful little girls. You forgot about the Adelson maxi in Daiquiri Pink - amazing!! One day we should time our visit - shopping with Linda at Persnickity Palm is always fun!! 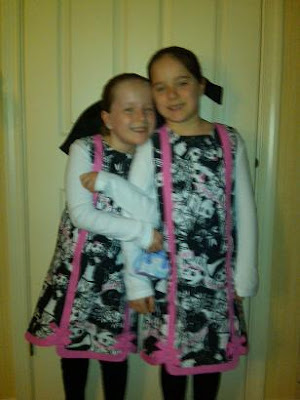 Your little ladies are adorable ~ love their new goodies. I'm so ready for warm weather so I can start to wear my "fun" clothes again. Your minnies are darling in their dresses. I got the Lilly catalog with that dress on the back today and my daughter said, "I love that dress Mom." Clearly a hit with the girls! Look at your precious Minnies! Love it that THEY love Lilly as much as their cute mama!